Please copy and paste ' [[Category:Sharks and Rays]] ' into the end of your article to include it in this category. 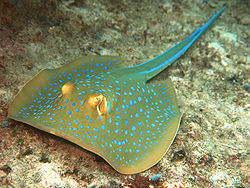 Fish in this category belong to the class of Elasmobranchii which includes sharks, skates and rays. The fish in this family are cartilaginous, possess small placoid scales and have no swim bladder. They mostly found in saltwater, but some that occupy coastal waters will also be found in brackish and sometimes freshwater also. Truly freshwater sharks are exceptionally rare and endangered in the wild, however truly freshwater rays are proving popular in the pet trade. Pages in category "Sharks and Rays"
This page was last edited on 16 October 2015, at 13:05.